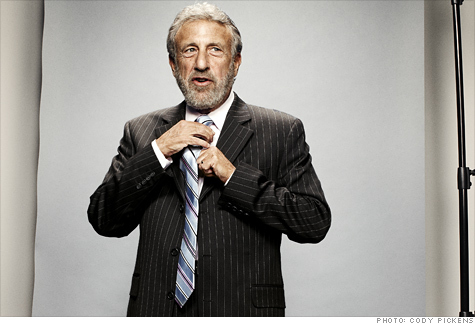 FORTUNE -- Men's Wearhouse founder George Zimmer discusses his strange trip from the trunk of his car to starring in his own TV ads. I never considered the clothing business in college. But my father was a manufacturer of men's wear in the Northeast and wanted to investigate manufacturing in Asia. In 1972 he sent me to Japan, Taiwan, and Hong Kong for four months. I'm convinced it was his way of getting me into business, rather than letting me be a hippie. When I came back from Asia, I went to Dallas and became the classic traveling salesman. I drove around Texas, Oklahoma, and Louisiana with men's wear samples from my father's line in my trunk, selling to department stores and men's specialty stores. It occurred to me that the concept of discounting, which stores like Filene's Basement and Loehmann's did in the North, hadn't gotten to the South, so I thought there was an opportunity there. I had $7,000 saved up. I got my father to send me some double-knit sport coats and slacks and gave him a third of the business. We opened the first Men's Wearhouse in Houston in August 1973, then a store a year for 10 years in Texas. In the early 1980s I opened a store in the San Francisco Bay Area. Within the year, the Texas economy was in total disarray. We were facing Chapter 11, and if not for the California store, we might not have survived. In 1992 we took the company public (MW) and opened 50 stores a year for a decade to become the dominant player in our category. In August we acquired Dimensions, the largest seller of corporate uniforms in Britain, and are going to grow our uniform division as we've grown in retail men's wear. Invest in your workforce We spend millions to keep our employees happy, and have one of the lowest shrinks [an industry term for stealing] in the retail business -- about 1% of sales. We host black-tie holiday parties, created a fund for employees who need emergency help, and send top store managers to annual retreats. Develop trust with customers We rent one in three tuxedos in the U.S. and Canada, and if we make a mistake, our employees will deliver to the customer's home, office, or wedding. We get a couple hundred letters a week praising the service in our stores. Find a good slogan In 1997, I was working with Greg Wilson of Red Ball Tiger, our ad agency at the time, when he came up with an addition to the famous slogan "I guarantee it" that I was known for saying. Wilson convinced me that men are self-conscious about their appearance, so there was more value in telling them, "You're going to like the way you look. I guarantee it."